The LOAD MANAGER is a precision solid state controller which sequentially switches ON seven relays at 1/2 second intervals. Individual switches, which the user may install, can select a combination of outputs. These switches may be used to turn the outputs ON or OFF at any time. The Master Control switch starts the sequential switch when it is turned ON. Likewise turning the Master Control switch OFF sequentially deenergizes the loads at 1/2 second intervals. In addition the LOAD MANAGER monitors the vehicle’s battery voltage. When electrical loads exceed the alternator output, the voltage drops. This is sensed by the LOAD MANAGER and the outputs are individually deenergized. Up to 5 outputs are controlled. Only as many are shut down as are required to maintain the system voltage. 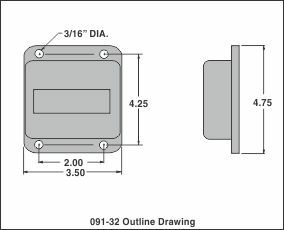 The shut down sequence may be altered by programming switches internal to the LOAD MANAGER and accessible through a removable cap. An output indicator terminal is provided to permit connecting an LED indicator which is energized whenever the load shed circuit is functioning. 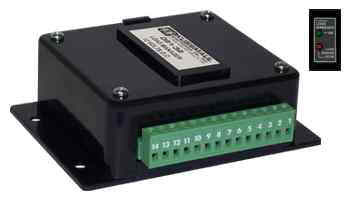 A remote bypass switch may be installed to completely bypass the LOAD MANAGER and operate the relays manually. A plug-in connector simplifies installation. Sequential switching of lamp loads is particularly important in vehicles with many lights. A Master Control switch that simultaneously energizes a large number of lights can momentarily reduce the vehicle’s voltage. Similarly the simultaneous removal of these loads can cause high alternator output voltage transients which may damage sensitive electronic equipment. The LOAD MANAGER sequencer assures that loads are applied and removed gradually, thus eliminating the possibility of inducing failures in the vehicle’s equipment.